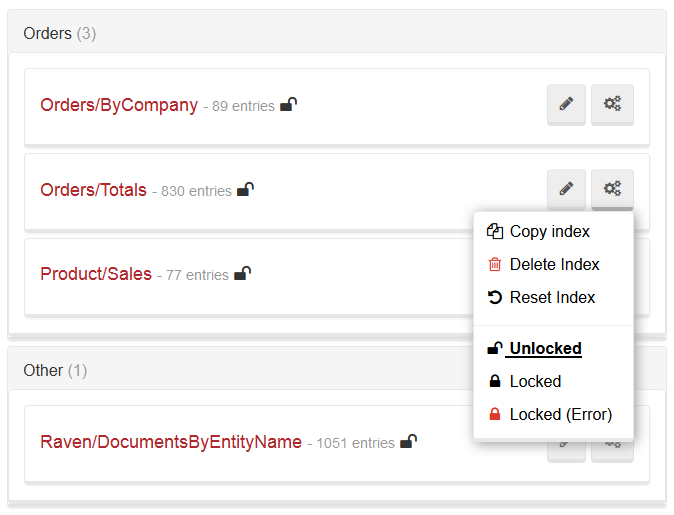 RavenDB indexes can be administrated easily by the user with a code or the Studio. An index usually needs to be reset as it reached its error quota and was disabled. Resetting an index means forcing RavenDB to re-index all documents matched by the index definition, which can be a very lengthy process. You can reset an index using either Client API or the Studio. You can delete an index by using either Client API or the Studio (please refer to the image above). This feature allows you to change an index definition on the production server. Index locking hes two possible results: either any changes introduced to the locked index will be ignored, or an error will be raised when someone tries to modify the index. You can update the index definition on the server, next update it on the codebase, and finally deploy the application to match them. While the index is locked, at any time when IndexCreation.CreateIndexes() on start up is called, the changes you've introduces will not be reverted. It is important to note that this is not a security feature, and you can unlock an index at any time. What do these priorities actually mean? The idle index will not be indexed by RavenDB during the normal course of action. Only when the database is idle for a given period of time (by default, about 10 minutes with no writes) will we actually get it indexing. In this case indexing will continue as long as there are no other activities that require resources. If such activities appear, indexing will complete its current run and continue waiting for the database to become idle again. The disabled index will use no system resources and will never take part in the indexing. This option is available so you can manually shut down a single index, for example when the index very expensive, and the system would be more effective if you shut it down while doing an import. Even idle indexes can take some of the system's resources, so there is yet another option available, namely the abandoned index. An index is abandoned if it has not been queried in the last 72 hours. Currently, RavenDB avoids indexing it even during the idle periods, yet it will get indexed eventually, if enough time has passed since the last indexation. You can find all of the time settings used by RavenDB to automatically manage the priorities of indexes in the configuration options page (look for options that starts with TimeToWaitBefore).